Home › Popular Culture › How does The Force in Star Wars relate to God and Spirit? I recently finished watching the animated 2008–2014 TV series “Star Wars: The Clone Wars,” along with the feature film of the same title that forms an opener for the series. Yes, I’m a fan of science fiction from way back. To be honest, I’m more of a Star Trek guy than a Star Wars guy. Star Trek is a real science fiction powerhouse, covering many classic sci-fi themes and storylines, and dealing with plenty of great moral, ethical, and social issues along the way. Star Wars is more of a big American action movie franchise, complete with the required big battles between good and evil. Besides the bigger, more action-packed battle scenes and the crazy alien-packed bar scenes that made Star Wars so hugely popular, Star Wars did bring one thing to the screen that the original Star Trek series didn’t: spirituality. Yes, it’s spirituality lite. But it’s still spirituality. George Lucas, the creator of Star Wars, intentionally injected spiritual themes into the Star Wars narrative. One of the major ways he did this was through a pervasive plot element called “the Force”—a sort of supernatural energy source that those attuned to can use to improve their skill and agility on the battlefield, not to mention throwing around the scenery and their enemies through telekinesis. Yes, the Force makes for some great big-screen combat effects. And the samurai-like Jedi evoke classic martial arts good-guy memes that movie viewers flock to see. But Lucas also wanted to get young people and adults alike talking about God and spirit. Just Google it, and you’ll see! There are more articles about the spirituality of Star Wars than there are episodes of Star Wars. Yep, Christians, Buddhists, Confucians, Hindus, and . . . well, you name it, they’ve written articles out about how Star Wars relates to their particular religious beliefs. That’s the power of the big screen today. Churches wish they could start such a big conversation about God and spirit! People of many different religions see themes from their own beliefs in Star Wars because Lucas drew from an eclectic mix of Eastern and Western religions to create the Force and other spiritual elements in Star Wars. Of course, this also means that none of the spiritual leaders of the various religions entirely agree with the spirituality of Star Wars. If it gets people thinking about spiritual ideas and issues, it’s part of the general influence of God and spirit on society. And that’s a good thing. Star Wars reaches hundreds of millions of people who never darken the doors of a church, temple, mosque, or other religious institution. So what does Star Wars say about God? Yes, I know. Many religious folks have analyzed the Force and compared it to their particular beliefs about God. But when it comes right down to it, God simply isn’t a character in the Star Wars universe. Okay, perhaps in a pantheistic sense (the idea that everything is God), God does figure into the Star Wars narrative. But everything is not a character. It’s just . . . everything. Saying that everything is God really isn’t saying anything about God—except that there is no distinct being that we could call God. Just add up everything in the universe, and that’s God. In practice, pantheism tends to mean either that the physical universe is all that exists, or that some sort of physical-spiritual universe is all that exists—with a touch of awe and wonder about it all. In pantheism, God is not a distinct being. There is no God who created the universe. In other words, pantheism is largely indistinguishable from not believing in God at all. To the extent that Star Wars draws on pantheism, it is agnostic about God as a distinct being. Star Wars is not a religion. It’s a fictional series. It doesn’t have to talk about God if it doesn’t want to. Are movie directors really the best source of information about the nature of God? What Star Wars does talk about is spiritual reality. You see, the Force is not God, nor is it the equivalent of God. Star wars deals only with the second and third levels of reality in this schema. From a spiritual perspective, despite the lack of God as a character, the presence of spiritual reality in the Star Wars universe makes the Star Wars franchise much more worthwhile than if it were just another big, dumb American sci-fi action movie with lots of great tech wizardry and a whole zoo of wild and crazy aliens. Yes, it’s great entertainment. Isn’t that what big action flicks are all about? But along with the entertainment comes a spiritual element of good vs. evil; of morality, selflessness, and concern for the good of others vs. immorality, greed, and a desire to rule over others and turn them into slaves. 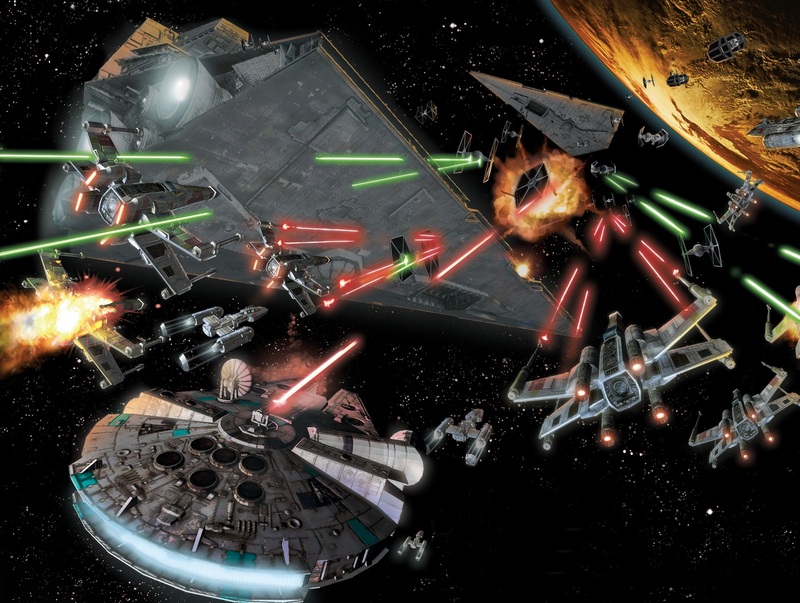 The vast battles in Star Wars are not only spectacular physical battles. They also represent spiritual battles. And the Force is an all-pervading element that connects every battle with spiritual reality. A dead giveaway that the Force is not God is that the Force has both a good side and an evil side. The “light side” of the force is the way of the noble Jedi order of Master Yoda and Luke Sywalker. The “dark side” of the force is the way of the evil Sith order of Emperor Palpatine and Darth Vader. However, spiritual reality does include both good and evil. In traditional religious language, they are called heaven and hell. And we humans do exist within the pull and influence of both heaven and hell. As expressed in the Star Wars universe, we exist in the tension between the light side and the dark side of the Force. All of the characters in the Star Wars narratives fall somewhere along the spiritual spectrum that stretches from powerful goodness and light all the way to powerful evil and darkness. And just as in real life, characters are tempted toward the dark side. Some of them yield to it, and become evil characters. Some of these are later redeemed from the dark side by choosing to act from compassion and goodness instead of from greed and a lust for power. And just as in real life, in the Star Wars universe no one is perfect. Even Yoda, one of the most powerful Jedi Masters in Star Wars, must confront and overcome his dark side. Even Yoda must learn through painful trials that if he is not vigilant, he, too, can slip into the darkness of pride and ego. Even Yoda must recognize that he has his limits—that there are some things he simply cannot do. None of the characters in Star Wars is equivalent to the infinite, all-powerful character of God. In short, though there are various references to Saviors and Chosen Ones in Star Wars, as I said earlier, God simply does not appear as a character in Star Wars. Does this mean that Star Wars is an evil, godless Hollywood phenomenon, as many religious conservatives have charged? Rather, Star Wars does not presume to teach its audience about who God is. But it does teach much about the nature of spiritual reality, and the spiritual struggle we humans face between good and evil in our own individual lives and in human society generally. And if Star Wars gets its vast audience thinking about issues of good vs. evil, of morality vs. immorality, of service to humanity vs. oppression of humanity, then the hand of God is present in it. You see, the very concept of goodness, morality, compassion, and concern for our fellow human beings is an expression of the nature of God. When a hugely popular movie franchise such as Star Wars deals in issues of good vs. evil, isn’t that one more avenue by which God reaches out to us ordinary, entertainment-loving people? “The Force” in Star Wars is not equivalent to God. But it is a mirror of the spiritual reality in which the human mind, and human society, exists. That spiritual reality is reaching out to us through the minds of George Lucas and a whole host of other people who have brought us the Star Wars universe. ‹ If You’ve been Married More than Once, Which One will you be With in the Afterlife?